Located in southern New Hampshire, Mount Monadnock is a perfect destination to learn about and practice basic mountaineering skills. This course is designed to be safe, fun and informative. We will be covering some of the basic mountaineering skills, including being prepared, map and compass use, proper body belay and rappel techniques, the Hypothermia Wrap and the Zarsky. We will locate the steepest cliff face on the mountain, known as the Black Precipice where we will practice some of the mountaineering skills previously mentioned. PREREQUISITE: Must have previous climbing experience. Located in Leominster State Forest, Crow Ledge is easily the best traditional, lead climbing destination in north central Massachusetts. Crow Hill, as it is referred to by the locals, overlooks several beautiful ponds and has cliffs ranging from 40 - 100 feet. Crow Hill offers quality climbs for beginners and experts alike. This is a great local destination to develop your skills as a climber and learn how to set up top-rope systems. This course is designed to be exciting, fun and informative. Over two days we will be coverng the skills necessary to set up your own top-rope systems. This will include safety concerns, climbing commands, appropriate belay, climbing and rappel techniques. On the first day you will be taught how to create slings out of webbing and learn how to tie various knots necessary for anchoring, climbing and belaying. We will focus on what constitutes an appropriate anchor and learn how to utilize both natural and artificial anchors. We will practice setting up equalized, redundant top-rope systems and learn how to create an appropriate belay anchor. On the second day we will continue to practice setting up top-rope systems. You will be taught how to rappel with appropriate back up saftey sytems. You will learn how to create a prusik and use it to ascend a fixed rope. On both days we will take time to climb on the top-rope systems we set up. Located in Leominster State Forest, Crow Ledge is easily the best traditional, lead climbing destination in north central Massachusetts. Crow Hill, as it is referred to by the locals, overlooks several beautiful ponds and has cliffs ranging from 40 - 100 feet. Crow Hill offers quality climbs for beginners and experts alike. This is a great local destination to learn the skills involved in top-rope rock climbing. This course is designed to be safe, fun and informative. We will climb on the section of cliff known as the Practice Face. This section of cliff is approximately 75 feet high, offers spectacular routes for people new to climbing. With classic routes rated 5.4 to 5.8 this is a perfect place to learn about all the basics techniques for top-rope climbing. We will cover the basics of how to rock climb, including safety concerns, appropriate climbing commands, equipment use, proper belay and climbing techniques. Everyone will have ample opportunity to climb and belay on routes of varying degrees of difficulty. We will also briefly go over the Yosemite Decimal System used for rating different rock climbs. There are several great local ice climbing destinations in central Massachusetts and southern New Hampshire. Depending upon the ice conditions we will take the trip to one of the fantastic places which are perfect for learning how to climb vertical ice. Each of the local ice climbing destinations offers ice climbs that range between 20 feet to 80 feet tall with routes for beginners and advanced climbers alike. This course is designed to be safe, fun and informative. We will climb on ice routes that are perfect for learning the basics techniques for top-rope ice climbing. We will cover the basics of how to ice climb, including safety concerns, appropriate climbing commands, equipment use, proper belay and climbing techniques. Everyone will have ample opportunity to climb and belay on routes of varying degrees of difficulty. We will also briefly go over the NEI System used for rating different New England ice climbs. PREREQUISITE: Must have previous climbing experience. Located in North Conway, Cathedral ledge and Whitehorse ledge are two of New Hampshires most popular climbing destinations. Cathedral and Whitehorse both lie within the boundaries and jurisdiction of Echo Lake State Park, only a few miles from the center of North Conway. Cathedral and Whitehorse ledge are both beautiful, glacially-sculpted, granite cliffs that generations of climbers have come to enjoy. Cathedral and Whitehorse both offers climbers a wide range of routes to choose from. The cliffs offers wonderfully diverse climbing - rated from 5.3 to 5.13. Whether you love friction climbing, thin face climbs or jam cracks you are bound to find a classic route to fit your liking. Cathedral and Whitehorse also have some amazing aid lines to work on as well. It is no wonder that so many climbers have come to consider Cathedral and Whitehorse as two of their favorite climbing destinations in New Hampshire. This course is designed to be exciting, fun and informative. We will be covering the skills necessary to follow a lead climber up a multi-pitch rock climb safely. This will include basic rock climbing techniques for moderate face and crack climbing, belaying a lead climber, removing protection and maximizing safety and efficiency when climbing with larger groups. On Saturday, we will climb one of the popular, moderate slab routes up Whitehorse ledge. We will either climb Standard Route (5.5), The Stadtmuller-Griffen Route (5.6) or Wedge (5.7) depending upon which route is available. After climbing Whitehorse we will camp in one of the local private or State Forest Service campgrounds. On Sunday, we will climb one of Cathedrals most popular moderate routes called Thin Air. Ed Webster describes Thin Air in Rock Climbs in the White Mountains of New Hampshire as, "One of New Hampshires great rock climbs...". This classic route, rated 5.6, is traditionally done in 5 pitches and finishes just below the Airation Buttress. After climbing Cathedral we will have dinner in North Conway and then head for home. PREREQUISITE: Must have previous climbing experience. Located in Leominster State Forest, Crow Ledge is easily the best traditional, lead climbing destination in north central Massachusetts. Over 100 feet tall, Crow Hill, as it is referred to by the locals, overlooks several beautiful ponds. This is a perfect local destination to develop the skills involved in following a lead climber. PREREQUISITE: Must have previous ice climbing experience. Located in the White Mountains of New Hampshires, Crawford Notch is one of most popular ice climbing destinations in New England. Crawford Notch offers ice climbers a wide range of routes to choose from. The area offers wonderfully diverse climbing - routes NEI rated Grade 1 to Grade 5, with mixed climbs as well. Whether you love steep ice pilars or long snow and ice filled gullies you are bound to find a classic route to fit your liking. With classic moderate routes like the Willey's Silde, Shoe String gulley, and Cinema Gulley it is no wonder that so many ice climbers have come to consider this area one of their favorite ice climbing destinations in New Hampshire. This course is designed to be exciting, fun and informative. We will be covering the skills necessary to follow a lead climber up a multi-pitch ice climb safely. This will include basic ice climbing techniques for moderate ice flows and snow gullies, belaying a lead climber, removing protection and maximizing safety and efficiency when climbing with larger groups. On Saturday, we will climb one of the popular, moderate routes in the area depending upon which routes are in and available. After climbing we will stay in one of the local hotels or motels and have dinner in town. On Sunday, we will climb another classic moderate route. After climbing we will have dinner in North Conway and then head for home. PREREQUISITE: Must have previous rock climbing experience. Located in Leominster State Forest, Crow Ledge is easily the best traditional, lead climbing destination in north central Massachusetts. Over 100 feet tall, Crow Hill, as it is referred to by the locals, overlooks several beautiful ponds. This is a perfect local destination to learn and practice some of the basic self-rescue skills every rock climber should know. This course is designed to be exciting, fun and informative. We will be covering the some of the self-rescue skills necessary to deal with unforseen situations that you might find yourself in rock climbing. This will include techniques for freeing your hands and escaping the belay; creating a 3 to 1 and 5 to 1 pulley system; the assisted hoist; how to use prusiks to ascend the rope; the extended rappel with the auto-block backup; Simul-rappelling with a backup; an assited rappel. PREREQUISITE: Must have previous rock climbing experience. Located in Leominster State Forest, Crow Ledge is easily the best traditional, lead climbing destination in north central Massachusetts. Over 100 feet tall, Crow Hill, as it is referred to by the locals, overlooks several beautiful ponds. This is a perfect local destination to develop the skills involved in following a lead climber. This course is designed to be exciting, fun and informative. 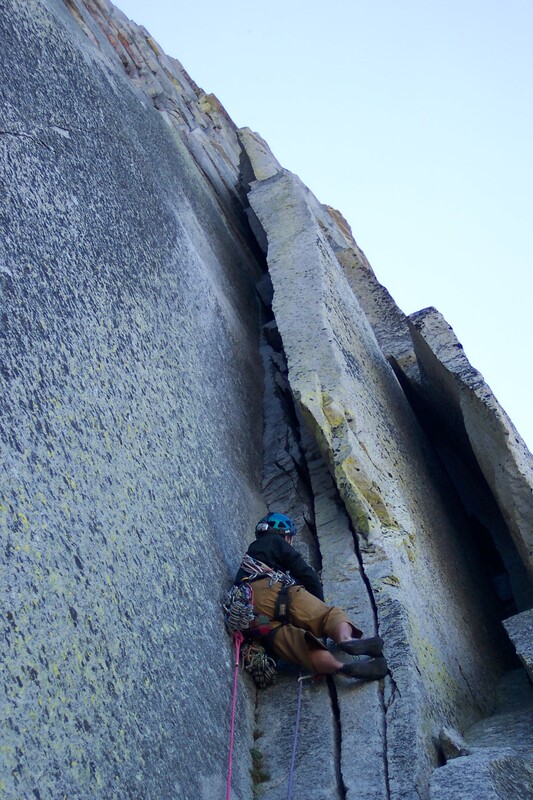 We will be covering some of the skills necessary for traditional lead climbing. This will include lead climbing techniques, placing protection, keeping a good plumb line, the dynamics of a leader fall, fall factor, creating appropriate anchors, belaying and protecting the second and maximizing safety and efficiency. We will spend the first part of the day going over placing protection and setting up anchors. Then we will practice by doing mock leads on top-rope and the participants that are ready will be able to attempt their first real lead climb. LOCATION: To be determined depending upon ice conditions. PREREQUISITE: Must have previous ice climbing experience. We will go to one of the several local ice climbing spots in central Massachusetts or southern New Hampshire to teach the technical skills necessary to lead ice climbs. This course is designed to be exciting, fun and informative. We will be covering some of the skills necessary for lead climbing on ice. This will include lead climbing techniques, placing protection, keeping a good plumb line, the dynamics of a leader fall, fall factor, creating appropriate anchors, belaying and protecting the second and maximizing safety and efficiency. We will spend the first part of the day going over placing protection and setting up anchors. Then we will practice by doing mock leads on top-rope and the participants that are ready will be able to attempt their first real lead climb. Want to sign up for an adventure?